This will just be a quickie, as I am officially ONE MONTH out from delivering the manuscript for the new novel, so I will be a little less verbose in this post, as I'm saving the words for the book! Are you fully up to date on our basement countertop situation? No? Read THIS. And then read THIS. All good? Excellent. So the final countertop for the basement arrived today. Once again, we relied on the amazing team from Cosentino to advise us on the choice. From a design perspective, this counter was going into the media room, to serve as the top for the console underneath the television. The console was created out of two salvaged cabinets from the second floor, that were originally part of the butler's pantry on that level. Our cabinetmaker created a third piece with sliding open drawers to accommodate the AV equipment that is coming. And on the far end, the Marvel beverage center . We knew we wanted to use Silestone again, since we hope this room will get a lot of use, and that stuff is indestructible...we didn't want to have to worry about staining or chipping or anything like that in what is essentially our rumpus room. When we were at the Cosentino Center, looking at options, we were leaning towards a simple slab in a pale oatmeal color. We thought it would pick up the lighter color of the stone, and also be a nod to the drapes we were planning to hang for blocking out light during movie nights. They had several options in that palette, so there was plenty to choose from. I was looking at the samples with our fabric samples when Erik, who runs the show over there, suggested I look at one more option. Enter Pacific, from the Silestone Ocean series. 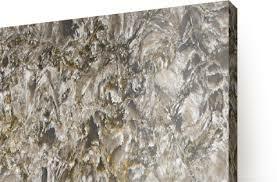 This is a beautiful marbled slab, with tones of dark and light gray, taupe, oatmeal and ivory. Essentially, it picks up all the colors of our stone wall, as well as the gray in the paint and the color of the drapes. The minute Erik showed it to us, any thought of a basic solid went right out the window! This is why it is so important to work with great people and solicit their input. This is a material we would never have thought of on our own, or pulled off the sample wall, but the moment it was on the table with all of our fabric samples and paint samples etc., it made perfect sense! You might have what you consider to be impeccable design sense, but that doesn't mean that there aren't wonderful opportunities for expansion of your own ideas. When I first met with Costentino about the basement countertops, I had three totally different ideas in mind, all of which would have been lovely. But I ended up with their guidance finding three products that are all very different from what we originally envisioned, and all of those choices, I think, upped the ante on the wow factor. The slab has entered the building! Setting it in place, notice there is a notch cut out at the back that lines up underneath where the wires for the AV equipment will go, so that when things get installed, the necessary wiring can slide right up through the countertop. This was a Stone Masters recommendation, and I'm so glad that they thought of it, because otherwise all of the equipment would have to sit on top of the counter, and this way it can all be hidden in the console. GENIUS! Laying down the silicone adhesive under the top. Doing the final caulking with clear silicone, just to make sure that if someone spills a drink (Looking at you, Lancaster) it can't seep behind the counter and damage anything. THERE IT IS!!!! Even more gorgeous in the room than we had dreamt of! Look at how perfectly the colors work with the stone walls. Many many thanks once again to Erik and the team at Cosentino Chicago for helping us find such beautiful products for the spaces, and for Tom and Robert and everyone at Stone Masters for fabricating them and installing them with such precision. Once again, I implore you to like both Cosentino and Stone Masters on Facebook, and if you are in the greater Chicagoland area, I cannot recommend them enough as fantastic people to work with. We have already fully committed to working with all of them on every countertop in the house, so stay tuned for more fun information in the world of surfaces! I love everything you've done! you certainly have great taste!